You are currently browsing xahndra’s articles. I used these very same running slippers on October 7th for the Staten Island Half-Marathon. It was an extraordinary experience for me. I was overjoyed while I ran. I kept a positive attitude and a steady pace. I was joyful and smiling at the finish! It brought me back to the day I felt as though I was forcing myself to try and fall in love with running. The idea seemed like a fairytale—just as clicking my ruby-red-running-slippers to magically complete a race might sound to you. The puppy-love I was feeling with running didn’t stop there. 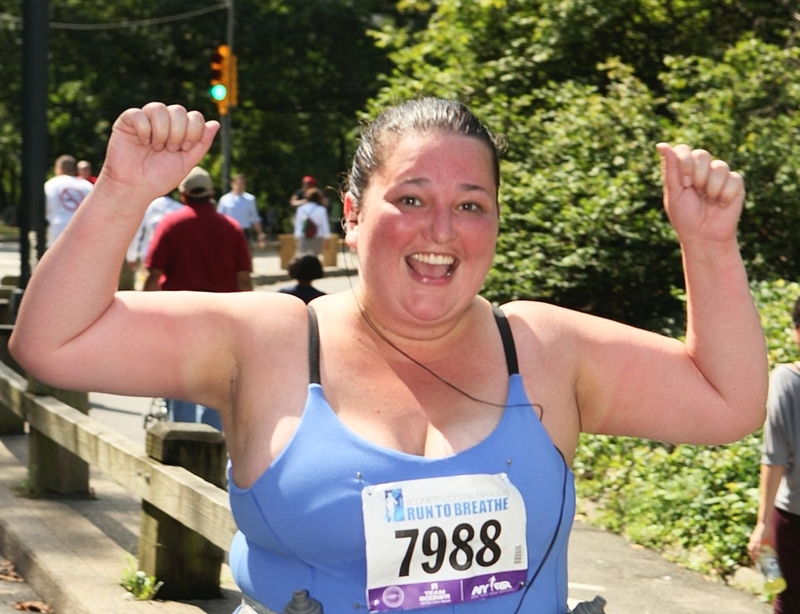 I recall how I was emotionally happy but physically beat up after my first 10K race in July. Practice on the following Tuesday was so painful, that I felt like quitting. I fully expected and prepared myself for a tough practice this past Tuesday after doing the Half-Marathon on Sunday. Guess what—that was absolutely not the case. I ran my fastest 5.1 miles ever at 1 hour, 9 minutes and 21 seconds. My first race ever, the “Take Your Base 5-Miler” on June 30th, I clocked at 1 hour, 17 minutes and 48 seconds. 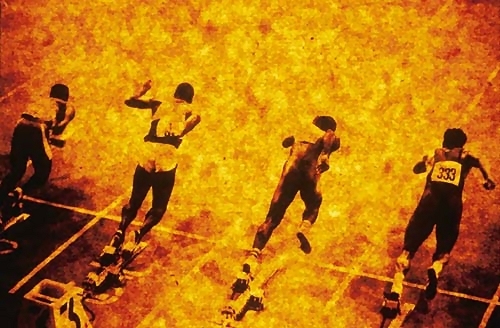 Even though it’s exciting, having a personal-record is not everything. To me, it’s more about how I’ve been feeling after my runs. I feel giddy and excited. After Tuesday’s practice, I remember thinking, “That was a GOOD workout!” I never imagined in a million years that I would be excited about how “good” a workout felt. So, indeed so much has happened in the last 2 weeks. I’ve had somewhat of a personal transformation. I am not getting over-confident though. Next weekend is my last opportunity for a long run before the big day. After this weekend, I begin to taper down on my mileage—while still practicing with shorter runs. I must must MUST hit 16-20 miles this weekend. I missed my target last weekend by 3 miles. But I am a “DetermiNator” and I am up for this challenge no matter how much time I have left to practice! And while “time” is in the spotlight, I must remind myself—TIME is after all why I am doing this. Whether you are an individual who is fighting cancer, surviving cancer, helping a loved one fight cancer, or remembering a loved one who lost the battle to cancer—we all want time and lasting memories together. The American Cancer Society gives people the greatest gift and their most precious commodity; time. 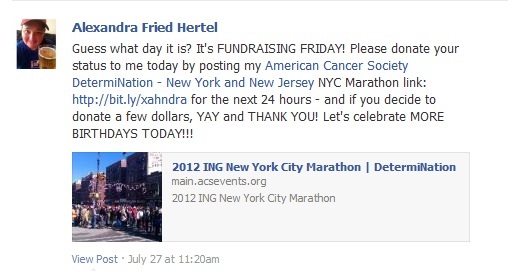 For more information on my journey to the ING NYC Marathon & fundraising efforts for the American Cancer Society, please visit http://bit.ly/xahndra. Speaking with Magee Hickey was exciting and motivating. Hearing more about her story made me want to keep pushing and working on my story. I didn’t have a pit in my stomach during the interview—I was overwhelmed with excitement. In the end of the interview, she asked me what my final message would be to anyone hearing my story. I said, “If I can do this, anyone can do this!” I really meant that. After my interview with Pix11, practice was already starting and I ran to join my team. It was test night—meaning, we needed to run 3 miles (with a short recovery time between each mile) as fast as we could. During the warm-up, I did a quick mental check. 1 – Hydrated / Fueled? Yes, Check! 2 – Positive attitude? Yes, Check! 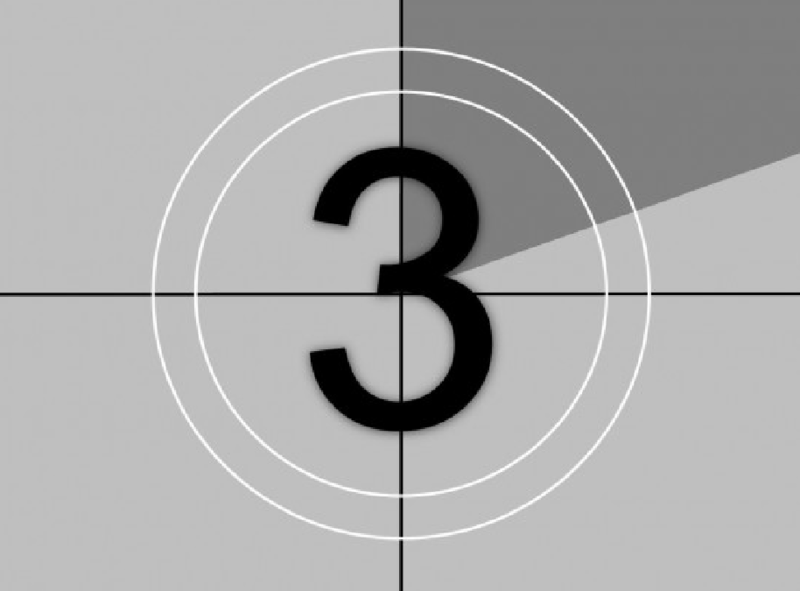 3 – Ready to do this? YES! CHECK!!!! The first mile, I pushed hard—like I was supposed to. During the recovery period, I had pains in my ankles and on the top of my feet. As a result, I had to take it very easy and slow the rest of my run. I recalled my statement to Magee Hickey… “If I can do this, anyone can!” IF I can do this, anyone can. Ah, and there is that heavy pit in my stomach. I carried that heavy pit in my stomach the rest of my run. Can I do this marathon? I. AM. SCARED. Fortunately, my dedicated (volunteer) coaches from the American Cancer Society did not leave me stranded with my self-defeating thoughts. Through investigation, discussion and observation, I learned the cause of my discomfort. 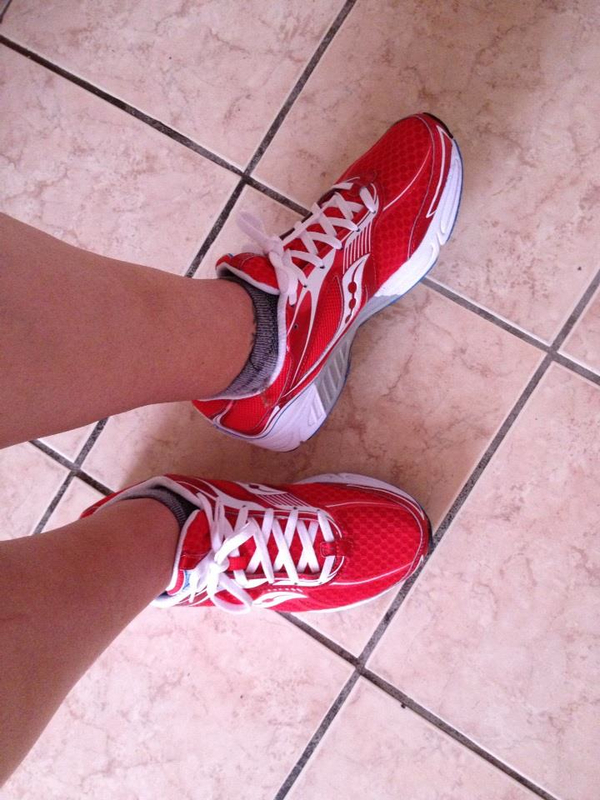 I learned that I’ve already worn out my first pair of running shoes (seriously?) and that I am not stretching correctly after my runs. What a relief! I can fix that! I honestly don’t mean to whine about my training. Perhaps I whine or get emotional because I am scared of the unknown. There is always silver lining to every issue, if you are willing to look hard enough. I didn’t have to look that hard for it this time, because I hit a personal record for my fastest mile ever at 11 minutes and 30 seconds. I’ve made vast improvements since my first run. I am stronger. I am training for a marathon. I will finish the marathon! I am doing this for the American Cancer Society so I can help others celebrate more cancer free birthdays… and at the same time, I am fighting for my health. 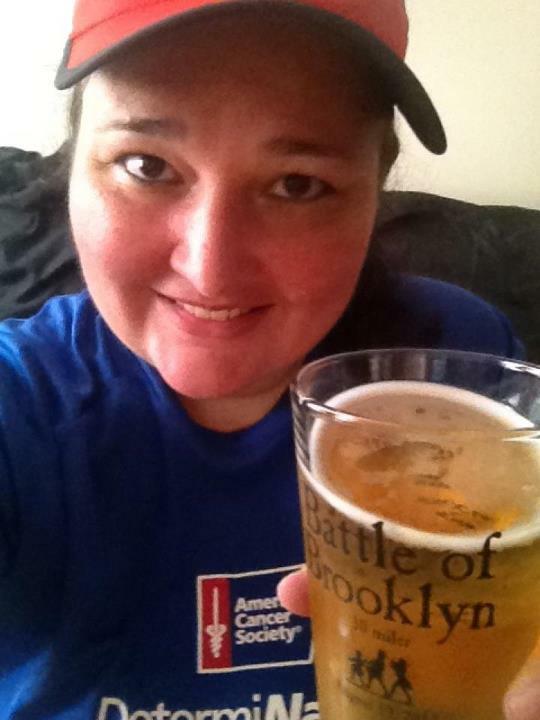 For more information about my race, please visit my fundraising page at http://bit.ly/xahndra. You can also sign up to be an official cheer station volunteer on race day here: http://bit.ly/CowBellCheer. Before a run, I wake up—excited… Usually it’s about 4 a.m. and I begin forcing myself to eat some oatmeal and a spoonful of peanut butter. I am anxious to leave the house, but I take my time filling up my water bottle, eating my breakfast and dressing for my big run. My mind wonders over every laborious bite of food. Is today the day that I will fall in love? Okay, I am going to be honest. Please forget what I am about to say after you read it. I am so embarrassed to admit, I do not like running, not one bit! Even so, every time I tie up my laces and head out; I am hanging on to a glimmer of hope. Today will be the day that I magically turn into a real runner! I see real runners every time I go out for my runs. Real runners love to run. Real runners don’t feel the pain that I feel while running—especially the pain I feel after a run. Real runners enjoy the solitary moments of thought while running. At least, that is what I imagine it is like to be a real runner. Last Saturday, I set out to run 12 miles. 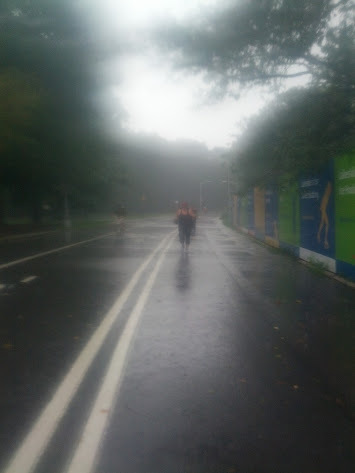 I arrived to Central Park; running for the first time with the Manhattan team instead of the Brooklyn team. At first, the run was going well. I enjoyed the company of a couple of runners I hadn’t met yet—both of which actually ran my pace. It was the first Saturday that I was running comfortably with others. The first 8 miles went so well. I was actually enjoying myself. My inner voice proclaimed, “This is the day! I am falling in love!!! !” Well, not so fast. It was so hot outside. I filled up my water bottle at every fountain and kept drinking. I felt tired. I had packed one packet of the Jelly Belly Sport Beans, but apparently that was not enough. I started to feel dizzy and, believe it or not, hungry! After I hit 11 miles, I knew I had to stop. I ran back to our starting area (after 11.2 miles) and bought a Gatorade and a hot pretzel from a vendor. I knew if I didn’t get some energy right away I might have gotten sick. After stretching, my body felt as though I was hit by a car. Defeated, I made my way back to Brooklyn. Wouldn’t you know it, the trains were delayed and running slow!? Frankly, even though it was a hot and long commute home; it gave me time to think. The reflection on the train home helped me build the courage to admit it. I DO NOT “love” running right now, but I am falling out of hate with it. I am enjoying the fact that I am active. I love that I am now a non-smoker. I love that I am busy doing something healthy for myself. So, I am courting “running” and eventually, I know that will grow into a very strong love of running. When I get discouraged, I will force myself to think about the days that I couldn’t run for more than 10 minutes. I force myself to remember what it was like to race out of the subway so I could quickly light up a smoke before heading into the office. Instead, I am running up the subway steps for a little extra push in my fitness. I will cling to the excitement I feel every time someone tells me that they notice I’ve lost weight… Well those are the things I am hanging on to that push me to my runs. This Sunday, I will be sharing my new habit with supporters for the Susan G. Komen Race for the Cure. I am excited to join our team of 20 (and counting) for this 5K run (or walk). My goal will be to beat my fastest time of 39 minutes and 12 seconds. I hope you will consider supporting your school’s team. You can support in a couple of ways. Click here to participate as a runner or walker. If you have a schedule conflict, you could donate and support the fight against breast cancer (at the same link). If those options don’t work, why not come out and cheer us on this Sunday? The cheers from the sidelines are so meaningful to runners in the race. I am so excited and can not wait for Sunday to arrive. Maybe this will be the day I fall in love! 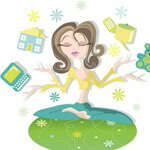 With the start of the Fall 2012 semester this week, those of us who took the summer off are quickly reminded of the juggling we will need to do in order to maintain our family responsibilities and jobs. Schedules need to be re-arranged, social outings declined or cancelled, and sometimes we have to ask others for help. I’ve already had to ask my brother to spend time with Athena, my daughter’s Chihuahua, because we are both keeping long days with work and school, and in my case, training for the marathon too. Asking for help has become a new talent of mine. It is how I have been able to raise over $2,500 for the American Cancer Society and how reaching the goal of $3,500 is attainable. Since the CUNY School of Professional Studies has an opportunity to fundraise for Komen’s Race for the Cure, I thought it would be fun to share a few of my fundraising secrets that have made “asking for help” a lot easier than it sounds. Social media has been my number one source for donations. Using Facebook, Twitter, Foursquare, Google+, LinkedIn and blogging, I make the opportunity available to many potential donors. I engage my audience of friends, family and colleagues by making meaningful posts about my progress, set-backs, victories and challenges. I invite others to comment, share, and get involved. I offer opportunities to support me with either financial support, moral support—or both. I try to think of gimmicks and mini-goals. For example, the hashtag on Twitter, #FF stands for FollowFriday. Many Twitter users actually search for that hashtag to see what fun people to follow on Fridays. Also, people pay attention to the #FF in their Twitter feed. So, I made #FF stand for something else. FUNDRAISING FRIDAY! Fundraising Friday works best when you have some sort of mini-goal associated with it. For example, a few Frundraising Friday’s ago, I was very close to the 50% mark. I needed just a hundred dollars or so. By the time #FF Fundraising Friday was almost over, I needed just $19.25 to hit 50%. I sent out a tweet and status update requesting that amount and instead I received two more $25 donations pushing me well over 50% of my goal. 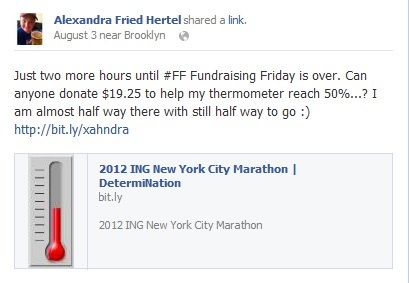 It’s fun because now some of my teammates are using #FF Fundraising Friday and having success as well. 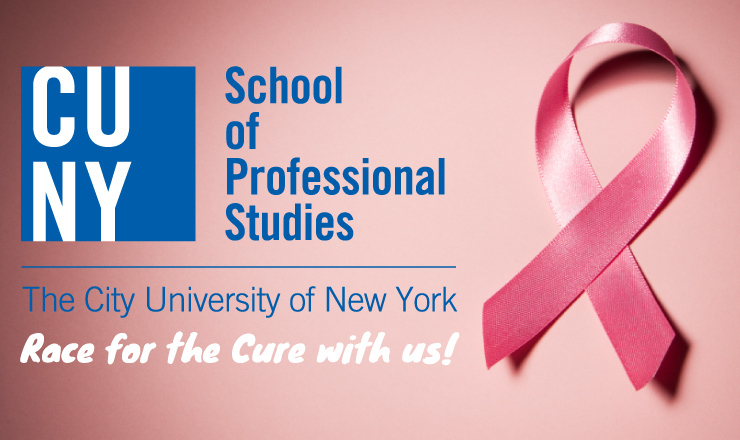 Try using #FF this Friday as a member of the CUNY SPS team for Komen’s Race for the Cure. Let me know if it worked for you too! In all my tweets and updates through social media, I try to engage others. If I can get a well known handle to retweet me or donate their status update for me, it’s a good day for my awareness. I always tag organizations on Facebook and Twitter. I’ve actually been retweeted by authors, sporting good stores, and the American Cancer Society. When this happens, it’s a great day for my awareness campaign! I’ve even asked for a status updates and tweet donations from my friends and followers. It’s really helped me reach the friends of my friends. In the last 3 months, I’ve actually doubled my number of Twitter followers. This will really help me for the next time around. Outside of social media, I write bi-monthly email updates to all my contributors, family, friends and colleagues. This keeps them engaged and aware of the huge impact they’ve made in my life and reminds them of the good cause they have contributed to. I write updates to the blog on my fundraising page regularly, reporting my progress and milestones. I’ve held two happy hour fundraisers with friends and colleagues and I plan on doing a bake sale in the office. There really are so many little things that a #CharityRunner could do to raise big money without costing too much time. So, here’s my personal challenge to the CUNY SPS community. As a team, let’s try to raise some serious cash for the Susan G. Komen #RaceForTheCure! So far we have 17 team members. If each of us raised $100, we would be making a huge impact with $1,700 raised as a team. That’s almost half of what I am raising on my own for the American Cancer Society. Can we do it? I think we can! To join our team and efforts, please visit http://bit.ly/CUNYSPS. In early June, on my very first group run with the American Cancer Society’s DetermiNation team, I ran for 10 minutes and wanted to cry. Not even 3 months later, through practice and DetermiNation, 10 minutes turned into 10 miles. Last Sunday, I ran for 10 straight miles for the first time through my participation in the Jack Rabbit Battle of Brooklyn race in Prospect Park. 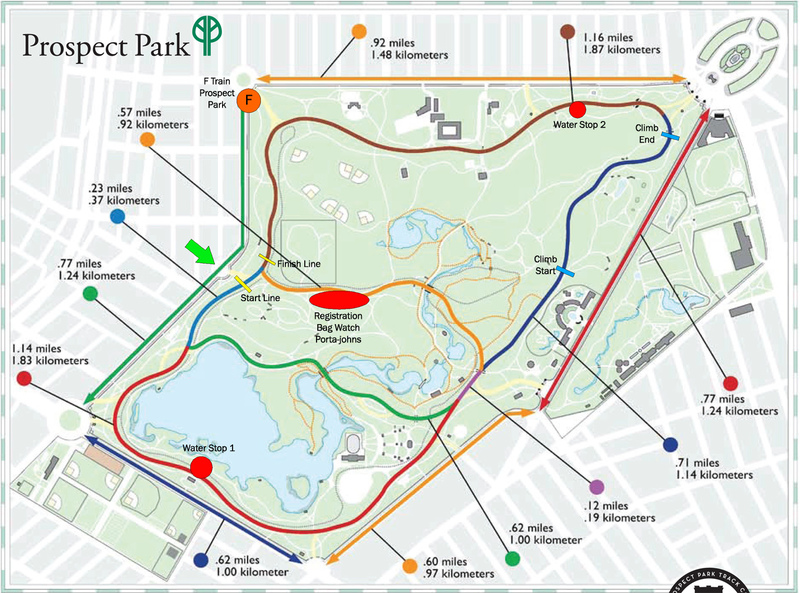 The course consisted of three laps around Prospect Park. Each loop was just a little over 3 miles making the total course 10 miles. It was generally a nice course, mostly in the shade with only one doozy of a hill. *Please note: This is a personal account of my experience and would like to recommend that anyone wishing to make drastic life changes first consult with a physician on the best course of action. Long runs are all about time on your feet. It’s not about the distance, but more about how long you are running for. When thinking about completing a marathon, it’s not about getting to a 10 minute mile… it’s about conserving energy and practicing running for long periods of time. Short runs, for me, are about getting in a good workout that strengthens me as a runner. Currently, my short runs are anywhere from 3-6 miles. Initially, they were 1-3 miles. My Tuesday short runs are with the American Cancer Society team. As a group, our coaches teach us running techniques, such as correctly running up and down hills. It’s amazing the amount of detail that goes into a runner’s form! I spend time doing yoga, swimming , free weights or sit-ups during my cross-training. Monday is a requirement, but I add more days when my schedule permits. In the beginning, I practiced running twice a week and cross-trained once a week. Since I never ran before, I needed to start slow. Through the excellent guidance of my volunteer coach from the American Cancer Society, I learned how to set mini-goals for myself while running. Whenever I felt I must stop, I picked a landmark. I would say to myself, “I will only walk to that lamp post, and then I will start running again.” I would allow myself that amount of time to recover and then begin running again as far as I could. When I would feel like quitting again, I would pick a stretch goal and say to myself, “I can stop when I hit the top of that hill.” As soon as I stopped, I would immediately pick my landmark to make myself start running again. That’s really how I got through the first two weeks of running and that practice helped me with my stamina, and truthfully my mental game as well. Your mind plays tricks on you while you run. I am always having to talk myself through and encourage myself to keep going, even when my mind is tricking me into believing it’s time to stop; or that I can’t go any longer. This is the “mental game” that a runner must win. My mental game was definitely a “battle” during the Battle of Brooklyn. I hated myself during miles one and two. 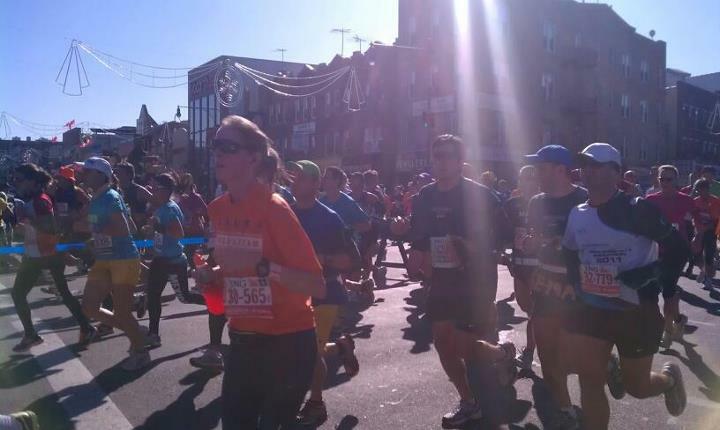 The entire time I was fighting with myself and telling myself that my plan to run a marathon was ridiculous. I seriously felt angry. A runner accidentally brushed past me, grazing my arm and I wanted to scream. I realized that there was no way I would get through the race if I kept up the bad attitude. Fortunately, just as that thought was crossing my mind, I saw a friend on the sidelines cheering me on. I was so grateful for that external aid which helped me snap right out of that bad attitude and run strong…for a few more miles at least. By mile four, I started seeing people pass me who were likely on their final loop of the race. It depressed me. I think that’s the hardest part of being in a race. I am so slow, and I know by the time I finish the party at the finish line is over. It was right then and there that I saw one of my volunteer coaches who had come out to cheer me and my teammate on from the sidelines. Amazing how things like that happen to make you feel strong again! So, I remembered coach’s words of encouragement during training: “This is YOUR training, this is YOUR race. Don’t worry about their training and their race.” I hung onto those thoughts until I hit mile five, the halfway point. I was so excited. I basically kept thinking how every step I took was closer to the finish line, more than halfway closer. That’s how I got to mile eight. At mile eight, I was convinced I wanted to quit. I was tired and every step was laborious. I remembered my coach again, “Don’t say you can’t do it, say you are doing it!” And that’s how I made it through miles nine and ten. Because I was running in my American Cancer Society t-shirt, strangers in the park would call out at me, “Go ACS!” and “Stay Determined!” This also helped me a great deal. While it’s so great to have strangers or friends cheering me on from the sidelines, I have to be prepared for the times when they are not there. Running can be very solitary at times. Staying positive and persistent is the only way to get through those times. Practice is not only for physical strengthening, but for mental strengthening as well. It’s so important to stay hydrated and get proper nutrition prior to and during a run. Some marathon runners actually seek the advice of a sports nutritionist in order to put together a personalized plan. It’s important to try these plans out while training instead of surprising your body on race day. I prepped the night before this latest race by being sure to hydrate and have a nice big dinner. I woke up at 4:00 AM for the 8:00 AM race and ate a big breakfast: potatoes, oatmeal and a banana. I brought with me some Jelly Belly Sport Beans, Gu Energy Gel, and some EFS powder for my water. Overkill? Yes, I think so! I definitely did not need all of that; and in fact, I regretted putting the entire EFS packet in my bottle of water. I use Nathan’s Quickdraw Elite which is a handheld water bottle that holds 22 oz of water. I think because I wasn’t used to it, it was way too sweet and too salty and I was just craving real water. I ended up mostly drinking the water from the water stations and hardly drinking any of my 22 oz of EFS water…maybe 4 oz total. I didn’t really care for the Gu, so I ditched that and stuck with the Jelly Belly beans. Even though I plan to continue to modify the fueling plans for myself, the way I fueled this time worked. I didn’t feel nauseous after running I had plenty of energy and was completely hydrated after the race. The only discomfort after race was the muscle fatigue (and soreness). Whether or not there are bystanders cheering you on at the finish line, it’s so rewarding to make it to the finish line of a race. I am always overwhelmed with a great sense of accomplishment; that often emotionally moves me. Whether a part of a race or part of a practice; every run is a milestone and something to celebrate. I constantly congratulate myself, and that’s how I make it to the next practice or run. Celebrating at the finish line! When you are part of a community, it’s impossible not to have others jump in to celebrate with you. For example, when I finished this latest race, I was 100% certain there would be no one at the finish line when I got there. What a huge surprise when I arrived, I saw two people still at the finish line cheering. It was my teammate, Rachel (who ran the race as well) and her roommate. After Rachel finished the race, they stayed and waited for me at the finish line until I got there. Their wait was at least 45 minutes, yet they still stayed. Out of 739 finishers, I came in 737th place running the 10 miles in 2 hours 22 minutes and 2 seconds. Perhaps that’s not the most impressive finish, but for me it’s a huge victory that I am putting in my pocket. I plan on putting another victory in my pocket very soon, the 2012 Komen Greater New York City Race for the Cure on September 9th in Central Park. Please visit http://bit.ly/CUNYSPS to sign up, see who is on your team and learn more about the Susan G. Komen foundation. It’s hard to believe that just over 3 months ago, I was a heavy smoker. I used to love smoking. I smoked on and off from the time I was 17. I really didn’t want to quit. I believed that there was no hope for me to ever find the desire to quit. That changed in January of this year. A colleague of mine was diagnosed with Hodgkin’s Lymphoma. It jarred me that this active and healthy young woman was facing such a scary illness and was now forced to fight for her life with every ounce of energy in her body. At the time that she was diagnosed, quite a few of my colleagues immediately joined Team in Training to run the NYC Half Marathon and raise funds in her honor. I contributed to the team, but completely shied away from participation. I was a smoker and far from fit. There is no way I would ever complete a mile, let alone 13 miles! Thinking it over brought me back to my memory of seeing the 2010 ING NYC Marathon. I had just relocated to Brooklyn from Ohio in August of the same year. I remember seeing the runners going by my street and thinking to myself that participating would be a dream for me – but that I would never be able to accomplish something like that. I remember thinking exactly the same thing when I watched the 2011 ING NYC Marathoners run past my apartment for a second time. Hearing the news of my colleague’s illness brought back all the feelings. I thought about the fact that I was smoking and that my grandfather died from lung cancer. As a single parent, I thought about how every time I smoked; I was shortening my presence for my daughter, and others that love me. I thought about the selfishness of my habit and how I would likely suffer life threatening consequences in the years to come. I thought about lung cancer, and how it’s mainly preventable. So many cancer patients don’t have prevention options like I potentially could. So there we have it. I began making plans to quit smoking. I’ve quit smoking before. Actually, I’ve taken a break from smoking. I’ve never really quit since I began smoking over 20 years ago. I needed an insurance policy. I needed something to hold onto so that I would never go back. 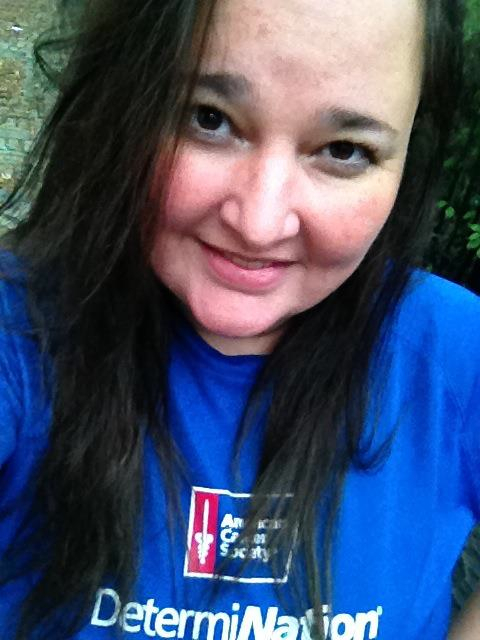 My involvement with the American Cancer Society and their team, DetermiNation, became my insurance policy. I embarked on a new beginning to get fit and help others. In doing so, I’ve accepted monetary donations from friends, colleagues and family members. In accepting those donations, I’ve committed to them (and to myself) that I would participate in the NYC Marathon on behalf of the American Cancer Society. And so, my insurance policy was created and I am stuck doing this marathon thing; even on days I really don’t feel like training. So, my journey began on April 27th. I quit smoking and made the decision to join the American Cancer Society’s DetermiNation team to run the NYC Marathon and raise over $3,500. It got incredibly serious for me on the first team run with the Brooklyn members in Prospect Park on June 9th. I couldn’t run for longer than 10 minutes without stopping. Through the encouragement from my community (comprised of American Cancer Society volunteer couches, family members, friends, colleagues and donors) I have kept with the program and have shown vast improvement. Now a non-smoker for over 3 months, I can run for over 2 hours (and 9 miles), without stopping. As a runner, I have good days and bad days. There are times I simply want to quit. For example, last Saturday, I ran from Prospect Park in Brooklyn to the Williamsburg Bridge (went about 1/3 of the way over) and then back again to Prospect Park. It was quite a run with hills and humidity. At 6.5 miles, I started feeling the chafing under my left arm and had to rest my arm on my hip to avoid further chafing. At that point, chafing was also beginning under my right arm. As a result, for quite some time I was running with both my arms on my hips. That really made me incredibly tired. I learned, in a way I will never forget, how important arms are while running! Not being able to use them to help guide my stride really exhausted me. My coach joined me on the last portion of my run. God love her for dealing with my whining, moaning, and desire to quit the last few miles back to the park. She really exercised great patience with me and kept encouraging me to work on my mental game. “Don’t say you can’t do it; tell yourself that you are doing it!” I really did have to hug that thought tightly in order to get back. Being a part of a community is the most rewarding part of getting involved with the American Cancer Society. They’ve given me the tools I need to find my footing in both the worlds of philanthropy and running. So, as a part of my transformation, I have joined a couple of races and causes along the way that are important to me. In June, I raised funds and competed in Boomer’s Cystic Fibrosis Run to Breathe; completing my first 10K ever. When I heard that CUNY’s School of Professional Studies would be joining the Susan G Komen “Race for the Cure,” I jumped on the opportunity to be a part of it. The last 3 months have profoundly demonstrated how rewarding it is to connect with the communities we are a part of. So, whether running, walking or wheeling – you can be a part of the movement too and feel the support of a community. I hope you will take your first step today by visiting http://bit.ly/CUNYSPS and joining our team. On Sunday, September 9th, we at CUNY School of Professional Studies will participate in our first Komen Greater NYC Race for the Cure in Central Park. We are honored to run and walk among over 21,000 breast cancer survivors and supporters to build awareness for this very important cause. 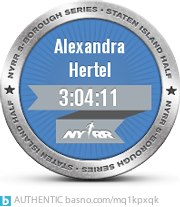 To prepare the CUNY SPS team for Race Day, we’ve summoned the help of our marathon runner correspondent and current student, Alexandra Hertel. Throughout the next month, Alexandra will serve as our official Komen Race for the Cure blogger during which time she’ll share her personal experiences and tips about race training. 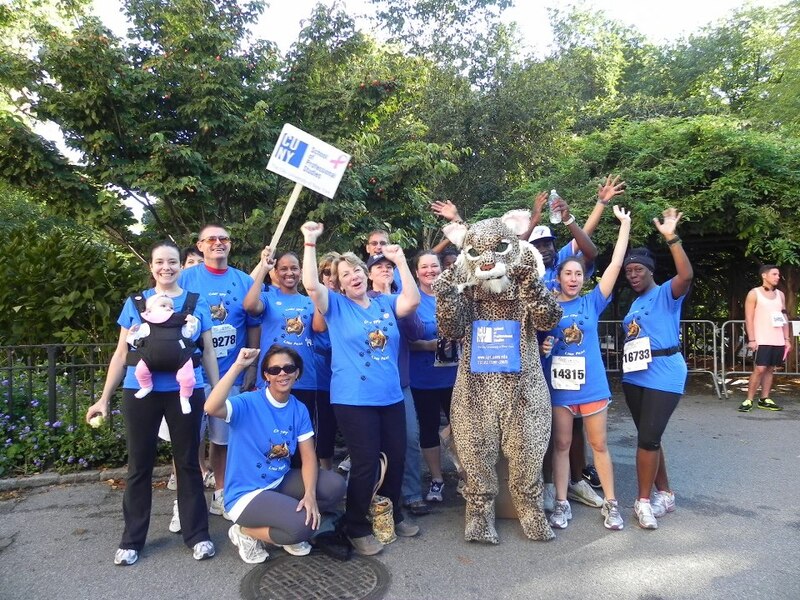 Remember, you can join the CUNY SPS team at any time from now until September 6th by visiting www.komennyc.org/race. I am grateful for the opportunities I have in my life. Because of opportunities like schooling at CUNY’s School of Professional Studies, I can be successful in many ways. I am a full-time student. I was recently awarded the Stephen M. Rossen Scholarship for the 2012-2013 academic year. I am excited to continue my studies and demonstrate why I received this award. I am a single mother. In all areas of my life, I strive to demonstrate positive values to my daughter, who is now embarking on her second year of college at the College of Staten Island. 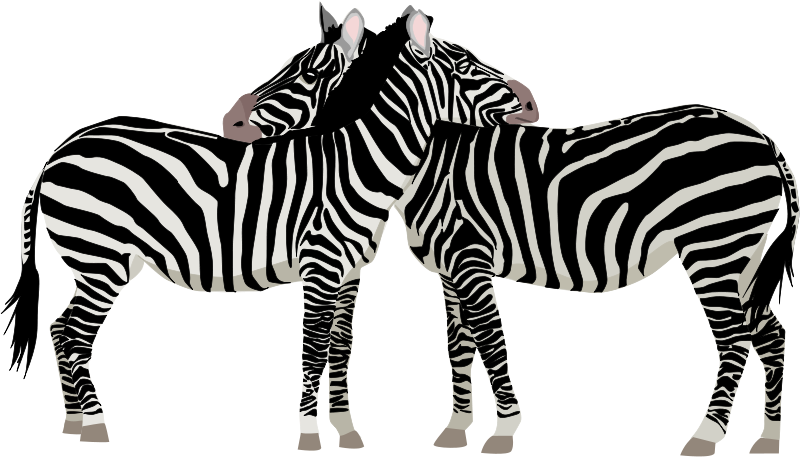 I work full-time selling event sponsorship and exhibits for conferences in the life sciences industry. My work is incredibly rewarding because ultimately, I am helping companies market and grow their businesses. I never thought I would be writing about the importance of getting involved in a cause. How can being a part of something bigger than myself change me? In fact, it has. It would be fair to say that allowing myself to be part of a larger cause has not only changed me, but also has saved my life. You’ll have to keep reading to find out how! I’ve been invited to share my story as a student blogger and weekly correspondent. Our journey begins now as we prepare for the Susan G. Komen Race for the Cure event on September 9th. I’m thrilled to be a part of it and for this opportunity to get to know our student community. I promise to be open, honest and unguarded. I will share all the good (and challenging) moments that I encounter as WE prepare for the Susan G. Komen race, and as I continue on in my journey toward the ING NYC Marathon on behalf of the American Cancer Society (Team DetermiNation) this Fall. Please visit http://bit.ly/CUNYSPS to visit our team page and join. I promise, you won’t regret it.